Let's talk baby-wearing! I'm not getting into the "should" or "should nots" because quite frankly, I'm over ALLLLLL of the "should" or "should nots" of parenting. 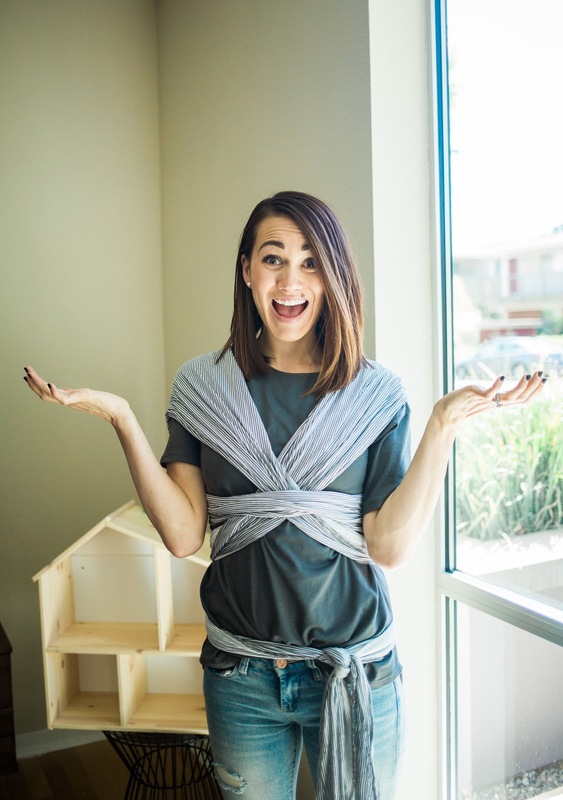 BUT if you've ever contemplated one of those crazy, criss-crossed, tied all over the place wraps, this post is for you! 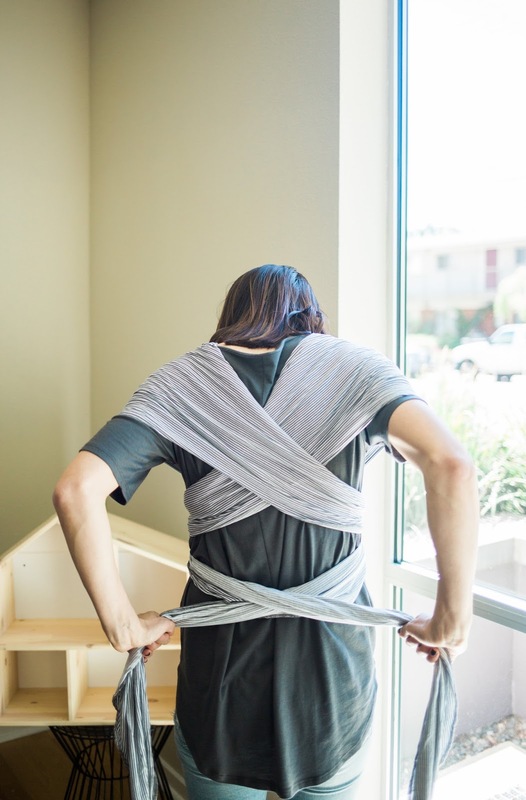 I wore Saydee in an Ergobaby a lot when she was little. I used a wrap a few times with her, but it was big, thick, and bulky and I just hated it. 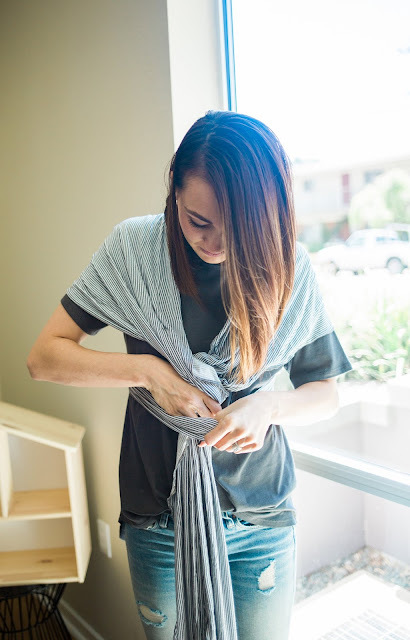 I have since found THE most amazing wrap from Happy! Baby Wraps, and I use it every. single. day. It's my lifesaver, is tiny and compact, and is still comfortable with my 16+ pound guy. So, if you've ever been intimidated by these things (they look scary, but are so easy) I put together a little step-by-step tutorial for you! Hopefully this is nice and clear, and helps you get that bad boy on with ease! Find the tag on the center of the wrap. 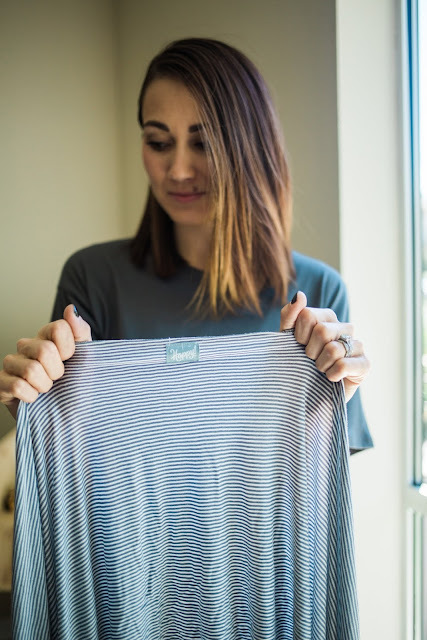 With the tag centered, wrap across your belly (I generally go just above my navel). It should look like this in the front, and you should also be this happy because you're doing great! Cross the straps in the front (again, makes no difference which way you cross). Tuck the straps through the label section, making sure they end up still crossed. Pull down on the straps to tighten them. ...yep! You guessed it, cross them again (no, it seriously still makes no difference which way). Bring them back around to the front and tie at your waist (I usually tie to the side because it might be a little weird/uncomfortable/awkward to have it hang down between your legs). Yay! You did it! Oh yeah, you still have to put something in there. Now on to the easy part! This wasn't supposed to be part of the tutorial, but it's probably the smartest step. 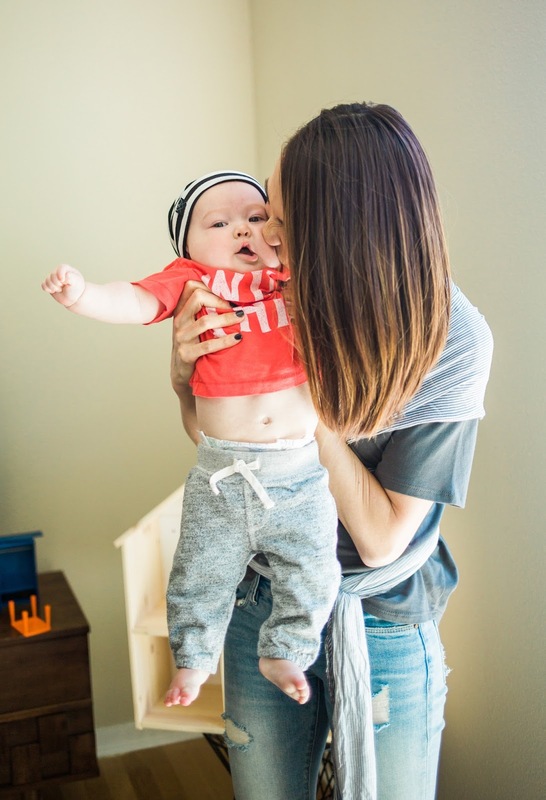 Check that diaper! Nothing worse than getting baby all settled and comfy, only to realize they're wet or stinky. 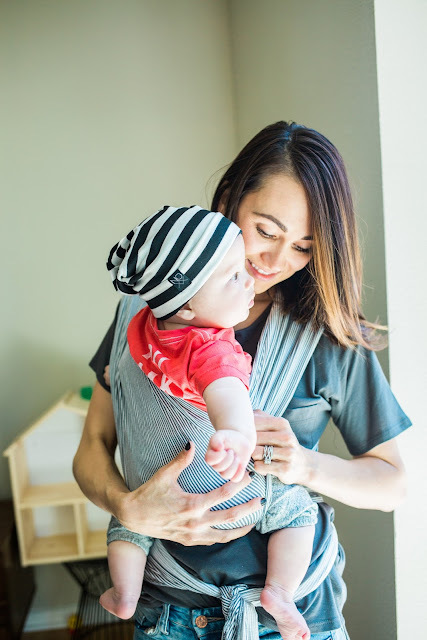 The first strap that you will wrap on the baby is the bottom (closest to your body). 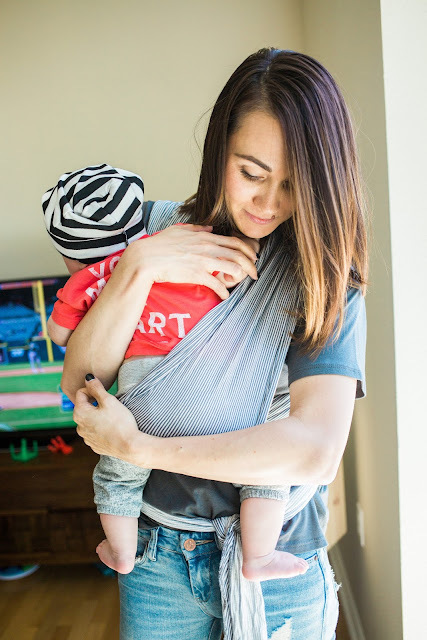 The easiest way to accomplish this move is to place the baby on the opposite shoulder of that strap, securely hold the baby, pull their leg through, and spread the wrap across their booty and back. Do the same thing on the opposite side, with the outer/top strap. Make sure those legs are in a good "froggy" position, and spread the wrap nearly to their knees. I find it a little easier to get the wraps spread once he's completely in. 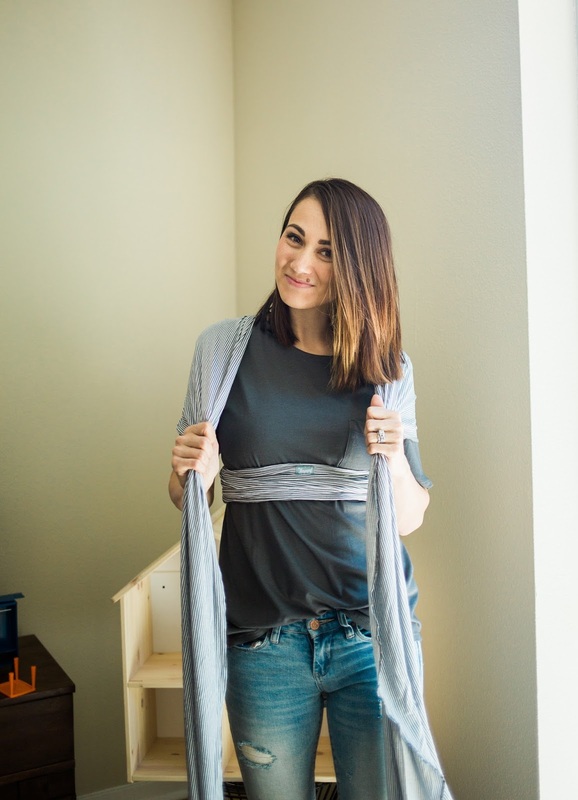 Lastly, grab the "tag" part of the wrap, the one that's across your belly, and pull it up and over both of babies legs! While keeping those froggy legs, pull it up and over baby's legs and cute little tooshie. 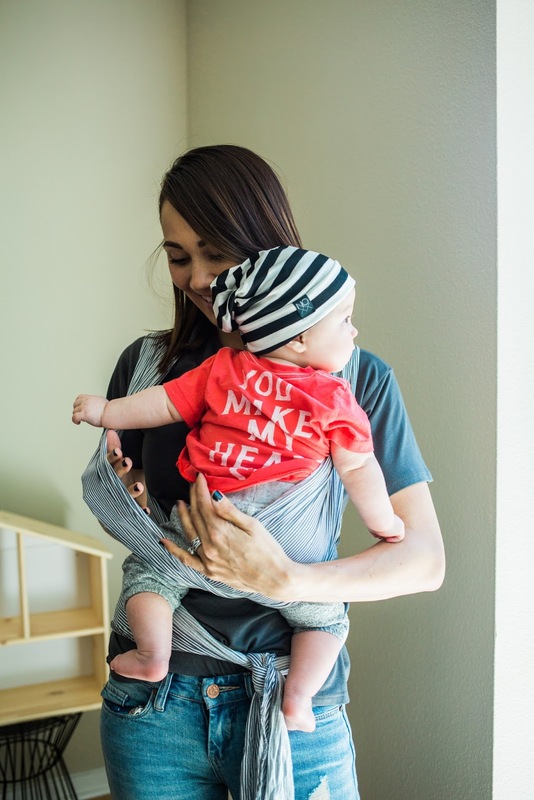 Pull that "tag" section waaaay up your baby's back (or up to their neck, if they are arms-in). From my experience, this wrap gives a little after wearing for a bit. I always error on the side of starting a little tight, and loosening if needed. 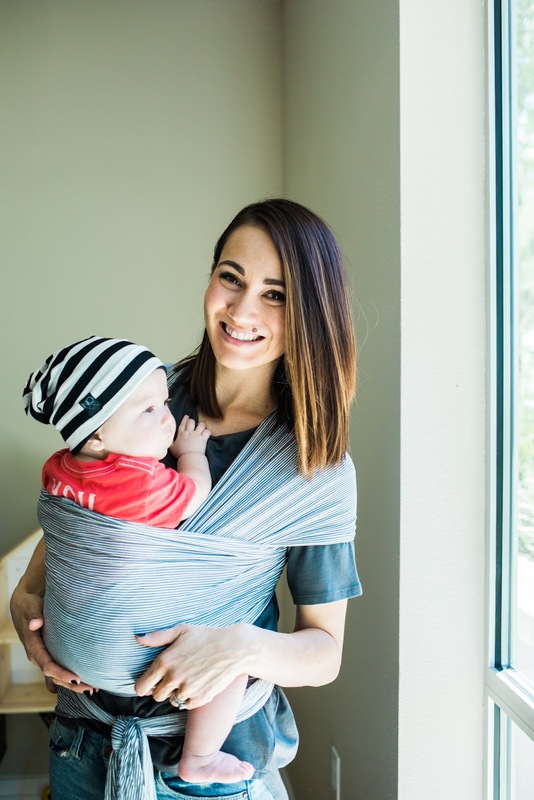 For any additional information head over to http://www.happybabywrap.com! 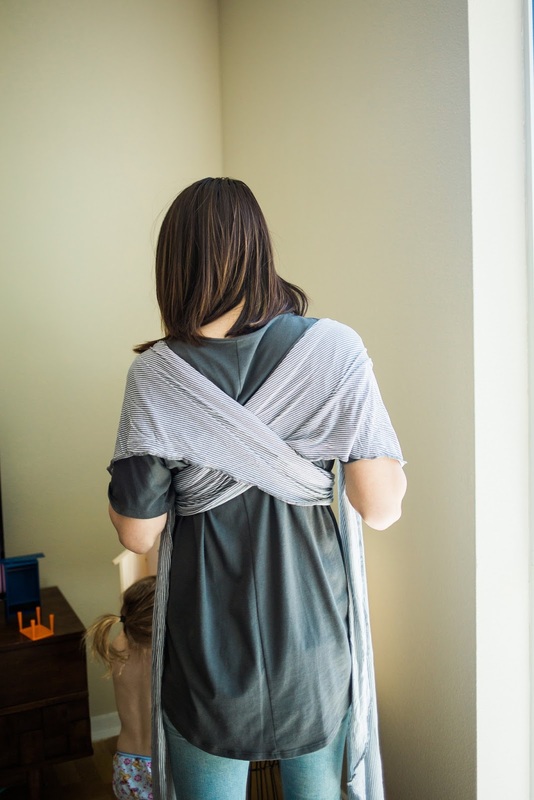 I swear by this wrap and it has been a lifesaver for this new mama of two! Please leave in questions or comments below in the comment section!